The directory structure that is used for projects could either make your life a whole lot easier or make it a pain when you are setting up your automated builds. Apart from being a crucial part of my automated build workflow, it also helps me makes sure that I can check out the project on a new machine and have the project be build-able right away both with the build script and in Visual Studio. 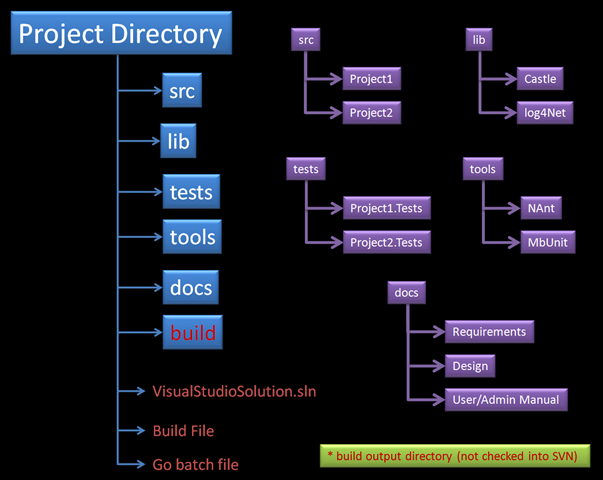 Here is the project directory structure that I have been using for a while now. I have been very satisfied with it. Since I use the same project structure for all my projects, I can use a template build script that I can use right away by changing a couple of values in it. What directory structure do you use for your projects? Thoughts? Suggestions? Exactly the same one I use with the exception of tests. I typically put those in a subdirectory of src. I also always have a db folder that contains all of my sql scripts, bak files for spinning up a quick enterprise gdb, or whatever. But basically the same thing and I too appreciate the cut’n’paste build scripts. Thanks for this post, I’m trying to get a directory structure nailed down. Where would you put an sql script directory? Also where would you put a SQL Server Reporting Services Report Project (composed of .rdl and .rds files)?